Hamish Marshall held up Hampshire's victory bid by spearheading a battling Gloucestershire recovery. 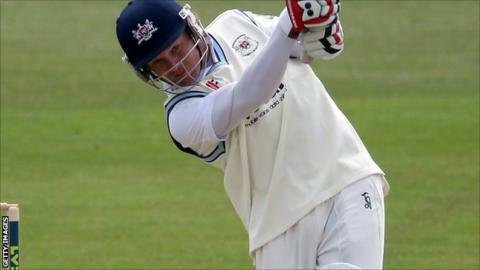 The New Zealander ended the day unbeaten on 84 as Gloucestershire reached 308-9 in their second innings. Marshall and David Payne (44) forged a record ninth-wicket partnership for Gloucestershire against Hampshire of 92 as they closed with a 190-run lead. Earlier, Hants added five runs to reach 422 all out, before James Tomlinson (2-62) took both home openers early. Meanwhile, Hampshire wicket-keeper Adam Wheater has gone for an X-ray on an injured finger but the Ageas Bowl outfit hope to have him available to bat tomorrow in Bristol. "A day of peaks and troughs for the home side; at six for two and with Klinger and Dent out, it looked like the match was unlikely to go into a fourth day. Yet at stumps, Gloucestershire had a lead of 190 and had given themselves an outside chance of a surprise victory. "Hamish Marshall's innings was as important when he was non-striker as when he was facing as he nurtured and encouraged firstly James Fuller and then particularly David Payne. "Payne and Marshall's ninth-wicket stand of 92 was a record against Hampshire, and although Payne was disappointingly out in the last over his 44 meant that at least his side had something to defend. He hit Michael Carberry for four, four and six in successive deliveries as he took the attack to Hampshire. "However, with the pitch unlikely to change much, Hampshire should still win; they will be keen to wrap up the Gloucestershire innings early to give themselves a whole day to get the 200 or so runs needed to secure their first win of the season."